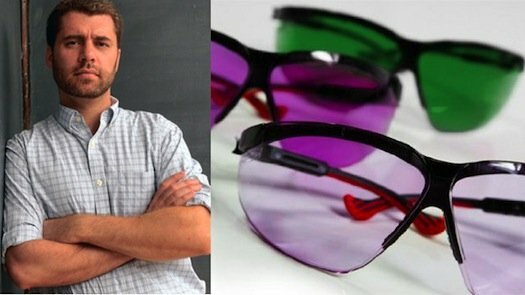 Could a pair of specialized spectacles be the cure for color blindness? An American research institue based in Idaho called 2AI recently announced exactly that. The Oxy-Iso lenses were originally developed to help field medics spot bruising and veins in an injured patient that would have been otherwise difficult to see allowing for better immediate treatment on site. Anyone who has had an IV can attest it's not an experience you want to endure over and over again because the medic could not see the vein clearly. But in a small percentage of test users, those that suffered from red-green color blindness, their red-green vision as well as their ability to see veins was greatly enhanced. While this is not a exact cure, just as wearing prescriptions glasses or contacts is not a cure for those of us who are near-sighted, it has the potential of greatly enhancing the color perception of the wearer. The downside to the technology at this point is that the lenses can not be worn while driving as they make yellow nearly invisible. So why use them at all? Why is seeing just a few more colors all that necessary? Mark A. Changizi (pictured above), the Director of Human Cognition at 2AI, states why red-green color vision is so important to our species. Previous theories thought that our three cone system evolved as follows: yellow-blue for living in a world with mostly green plant life, greyscale for depth and contrast, and red-blue for picking brightly color fruits out of the background. The problem with the rationale comes when you examine the diet of various primates who have the same color vision as we do. Depending on the geographic location and the diet of the species, you see huge variety in the visual requirements for survival. Wouldn't evolution have specialized vision to accommodate the diet of each species over time if that were the case? Changizi thinks those primates weren't looking at food but instead looking at each other. He postulates our "color vision was for sensing others of our own primate kind, to sense the ... signals we display on our faces, rumps and genitalia." And the human color vision even "evolved above and beyond that found in other mammals... allowing us to sense colour-signals on the skin, including blushes, blanches, as well as sensing health." This is an exciting break through for the few women but nearly one out of ten men that suffer from the condition. We want to know what you think. 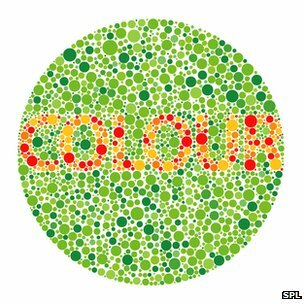 Are you color blind or know someone who is? Would you consider a sometimes fix for your red-green color blindness to perhaps see faces and emotions more clearly? Let us know in the comments. Hi. Its a really very useful blog. Thanks a lot for sharing. Getting in the swing of spring! A Modern Classic all in Pink?